The New Year always revolves around people making resolutions and trying to better their lives. Detoxing and decluttering yourself, physically and mentally can be amazing for your health and is something we are all about. 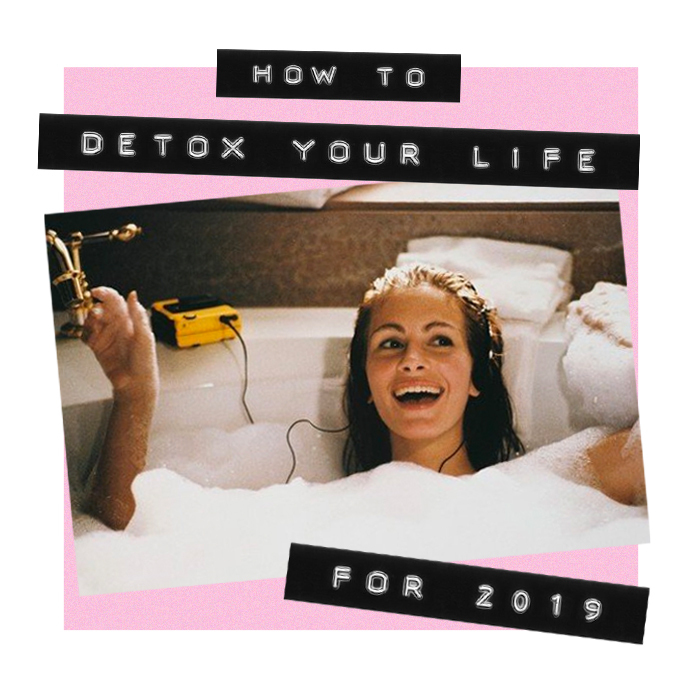 We have broken down and listed our best tips for detoxing your life for 2019. Taking these little steps can help you smash 2019 and leave you feeling toxic free. Whatever you don’t need and is getting in your way, get rid. Whether this is your desk at work, your draws or the stuff in the boot of your car – get rid. Having a cluttered space and cause a cluttered mind and we want to feel all the chills this year. If your body is telling you that you’re constantly feeling tired, uncomfortable and struggling to get in your summer shorts, then take action. Getting your body moving can reduce fat content, sweat out toxins and can leave you feeling SO good. 2019 is this year to cut the bull. No more trash. If you have a relationship with a person, friend or not, that is not healthy and bringing positives to you and your life, then bye. There are too many good memories to with good people, so say goodbye to those unhealthy friendships. Quality over quantity ALWAYS. Social media; the thing we all act like we’re not hooked on but we totally are. This year use screen-time to try and cut down on social media. Don’t follow anyone that makes you doubt your self-worth, even try deleting it for a period? You would be shocked to know how good it feels to pull back from your social media life and start enjoying yourself more. Re-evaluate how you talk to yourself and make changes. Take time this year to be more positive and don’t give yourself a hard time. If you’re feeling yourself? EMBRACE IT! If you have bossed your latest assignment? CELEBRATE IT! Praise yourself this year, we think you deserve it.